A fusion of romance, action and political intrigue from acclaimed fight choreographer and director Yuen Woo-ping. 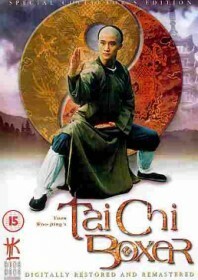 Despite the title, the film features very little authentic tai chi action. Jacky Wu Jing plays a spirited adolescent with dazzling kung fu abilities who looks set to steal the heart Christy Chung, who plays the daughter of a powerful family. The plot abruptly changes tone when an opium smuggling ring is uncovered, masterminded by savage gweilos and led by Darren Shahlavi. The plot threatens to get too big, especially after Wu’s character matures and becomes increasingly closer to his mother (which offers the wonderful Sibelle Hu more screen time). But thankfully the fighting breaks up any chance of an emotional stalemate, and Jacky Wu looks much better when he’s leaping about, kicking and slapping people in the face with his extremely long ponytail.